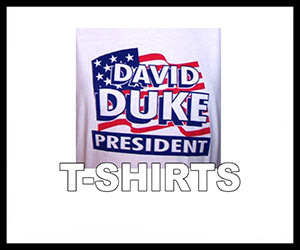 New Dr. Duke Podcast: Iran War: Don't let the Zionists unleash the Hounds of Hell! 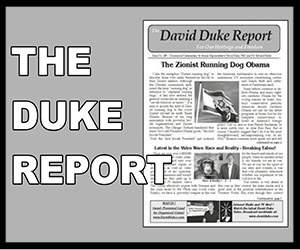 New Dr. Duke Podcast: Iran War: Don’t let the Zionists unleash the Hounds of Hell! 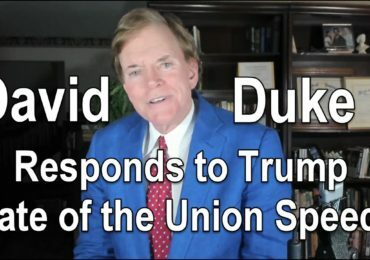 Listen to this powerful message of Dr. David Duke showing the insanity of the Zionist-planned, soon to be launched war against Iran, A war that will unleash the hounds of hell on all of us! 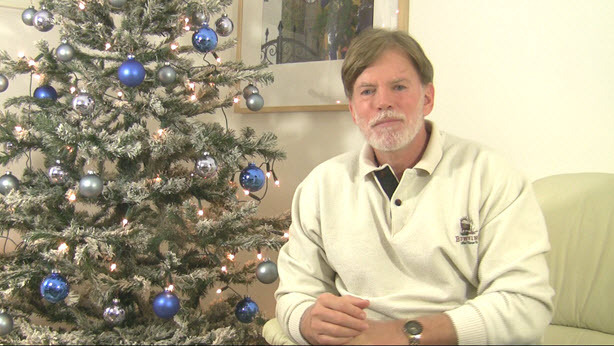 Here is the text of this powerful message from Dr. David Duke. The Zionist-bought political prostitutes in America and the West are edging us closer and closer to war with Iran. This war would be horrific for Iran, horrific for America and horrific for the world. Like the war in Iraq, this war is based purely on Zionist lies. This war would not only rain death and destruction on Iran, it would be devastating to you, your children, and the whole world. It would plunge the world into massive terrorism, triple the price of oil and gas, and cast the entire world into economic depression. This Zionist-driven war against Iran would unleash the hounds of hell on all of us. You might say: why should I listen to you? Well, think back to the eve of the Iraq War. Every Zionist-bribed and corrupted politician, and every Zionist-owned media conglomerate in the world told you that Saddam had weapons of mass destruction. I was one of the few who said it was all a big lie. I traveled the world exposing the lies about Iraq. I am on public record before the war saying it was a lie! After the war, George Bush’s own billion dollar search for weapons proved that I was right. Saddam had no weapons of mass destruction. Zionist warmongers like Ken Adelman and the Zionist Washington Post pushed the war in an editorial titled, “Cakewalk in Iraq.” Jewish supremacists Richard Perle and Paul Wolfowitz told you that Iraq would “Welcome us as liberators.” I said it would be a catastrophe for America, a Vietnam-like conflict in which tens of thousands of Americans would be maimed or killed. Who was right? Iraq became the longest war in American history. Here is a report from USA Today: “Pentagon officials estimated for the first time Wednesday that up to 360,000 Iraq and Afghanistan veterans may have suffered traumatic brain injuries.” Now that’s not counting tens of thousands who have suffered maiming, amputations, or death in this war based on lies. Wake the hell up America, this is a hundred times more Americans harmed than in the horrific Nine-Eleven attacks! 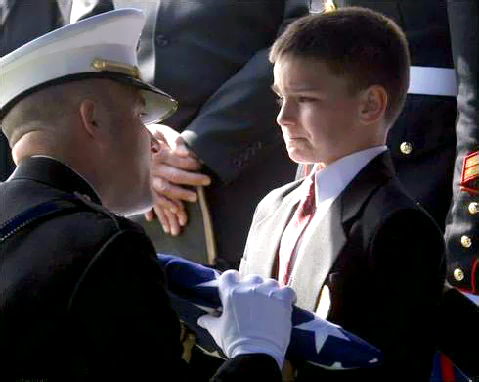 These young men and women in our military are just as much precious to America as the civilians who perished in Nine-Eleven. And these Americans were put into harm’s way for a lie, sacrificed for the interests of Israel, not America. Imagine if these soldiers were your sons or daughters. Or if a victim of the lie were your own father. How would you feel? I tell you how I feel, I believe it is naked treason to send Americans to die for a lie. And what about the Iraqis? The Zionist media told us it was a war for freedom. They even told us with a straight face that the Iraqi people actually wanted us to invade them, that they wanted us to bomb them and kill tens of thousands of their own sons who served in their military. They can get away with these lies because the Zionists own the media. They can effectively silence any voices of reason, or demonize them as they do me. I said that millions of Iraqi men, women and children would suffer or die in this war. The fact is that more than a million Iraqi men, women and children have been killed or maimed in this war based on lies, and millions more made homeless. Could you imagine bombs falling on your own home where you and your children sleep, burning your loved ones alive? Or having your home destroyed and you made refugees in your own nation? My fellow Americans, if you harm other people’s families, ultimately your own families will be harmed. If you deny the human rights of others, you will lose your own. 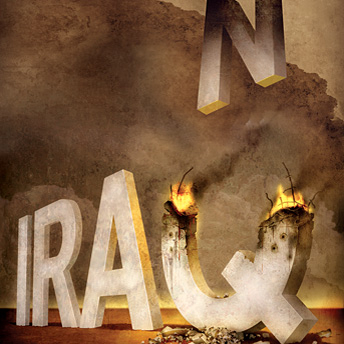 The Zionist warmongers like Wolfowitz and Perle and their gentile collaborators promised that Iraq would “finance its own reconstruction.” I said the war would likely cost more than a trillion dollars of your money. Who was right? Estimates are now, with upwards of a million Americans needing medical and psychiatric care from this war, that it will ultimately cost over three trillion of your dollars. Do you have any idea how much money that is you, as a taxpaying American must pay? What I am telling you is that Zionists and their collaborators in positions of power in the mass media and government are nothing but traitors. In America and all over the world, Zionists don’t have dual loyalty to Israel, they have loyalty ONLY to Israel. And they have, in effect, murdered and maimed your sons and daughters by the tens of thousands, bankrupted your country, made America hated throughout the world, and destroyed your own precious freedoms. Americans and Europeans are very decent people, but the politicians have sold their souls to Zionist evil. 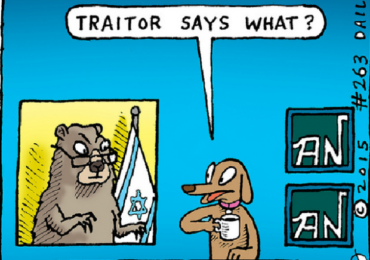 There are plenty of gentile traitors and Zionist collaborators. Dracula has his servants. And they too are criminal traitors who deserve prosecution for their crimes. Now the same usual suspects who pushed us into war with Iraq are pushing us to war against Iran. An even more catastrophic, evil war based on Zionist lies. This push for war of course is completely driven by Israel and the Zionist fifth column in government, big media and finance. They have the chutzpah to call Iran a threat to peace. Israel was created by massive immigration and then terrorist ethnic cleansing of hundreds of thousands of people. The Zionists then stole the land which was owned 90 percent by Palestinians. They have tortured tens of thousands of people in their dungeons. They have killed or maimed tens of thousands of men, women and children. They have invaded Lebanon twice and killed tens of thousands of Lebanese Christians and Muslims. They just recently bombed the people of Gaza and murdered one thousand two hundred people, half of them women or children. They have even committed terrorism against the United States of America in the Lavon Affair, and in the deliberate attack on the USS Liberty. If you know nothing or little about this that’s because you also don’t know that the Zionists dominate your mass media! The fact is, that unlike Israel, Iran has not invaded any other nation, but was itself invaded by Iraq at the behest of Zionists who controlled American foreign policy. American Zionist monsters even gave Iraq chemical weapons and live anthrax to Saddam. Think I am not telling the truth? Read the US Congressional Record. Now the Zionists are again ramping up the big lies – this time for a far more catastrophic war with Iran. They say Iran is building a nuclear bomb. The fact is that the UN IAEA says there is absolutely no evidence that Iran is developing nuclear weapons. Even the United States own Intelligence Estimate, a compilation of all the Intelligence agencies of America says there is no evidence that Iran is building a bomb. Israel is not only building atomic bombs every day, but has built them already in complete defiance of both America and the international community. In fact, Israeli officials regularly threaten to use their nukes on Iran! The fact is that Israel will not sign the Nuclear Non-Proliferation Treaty, but Iran has signed it. The fact is that Iran has allowed complete inspections. Israel does not allow any inspections of its huge stockpile of nuclear, chemical and even biological weapons! Who is the rogue state? Who is the real threat to world peace? The answer is Israel. But instead the Zionists and their servants want you to launch a war on a country that has not invaded any other for hundreds of years. The Zionist Globalists pound you with lies, lies, and more lies. How many thousands of times have you heard repeated on media that Ahmadinejad says he will “wipe Israel off the map.” I was less than 20 feet from Ahmadinejad at an academic conference in Iran on an occasion when he supposedly said this. 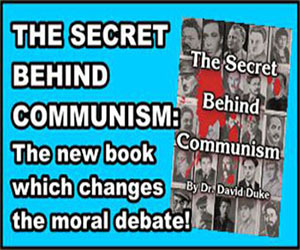 He actually said he believed that the Zionist regime would pass away just as the Communist regime fell in Russia. There was no mention of map or wiping Israel off the map. He said he believed this would come about through democratic change and that the human and civil rights of every human being must always be respected, be they Palestinian or Jew, Christian, or Muslim. The Zionists lied to you before the Iraq War, now they lie to you again. Iran is no Iraq. It is much larger, has many times the population and an overwhelmingly united and patriotic population. If horrific attacks are made on Iran, they will respond with everything in their power to strike back at their attackers. Just as America or any other nation would do the same. They obviously don’t have the air power or military weapons of the United States. But they would have millions of people who love their nation and their faith enough that they would sacrifice their lives to defend their country. Iran borders the Straits of Hormuz. There is no way that America could protect all shipping in that small confined area with mountainous regions of Iran all along the sea routes. Not only would such a war cause incredible loss of human life, unleash a terrorist response for years, but it would undoubtedly cause oil to go through the price ceilings established in the wake of the Iraq War. This insane war would destroy the economy of America, of Europe and the world. It would lead this world to horrific war and violence that would eclipse far more national boundaries than just Iran’s. Maybe you didn’t want to listen to me and other anti-war activists before the Iraq War. But maybe you are ready to listen now. It is time to think, to use your head and to use your heart. To think for yourself rather than letting the controlled Zionist media do your thinking for you. For the sake of your own family, your own children, your own community, your own nation, and every people on this Earth, act now, speak out, make sacrifices and stop this new War for Israel edging closer in Iran. For the love of God, for the love of decency, prevent this war. Don’t unleash the hounds of hell! Previous Post War With Iran Will Devastate America! And See my Video with over 1/2 Million Views! 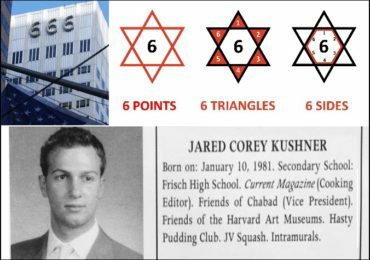 Next Post Jewish Supremacism Covered up by the Mainstream Media!